In this Kitchen Nightmares episode, Chef Gordon Ramsay visits The Grasshopper Also, an Irish pub in Carlstadt, NJ run by husband and wife Mitch and Maureen Sandler and Maureen’s father Chief. Maureen is clueless as to why the business is failing, everyone blames Mitch, saying that he wastes time and fails to keep the quality consistent and Mitch feels like everyone is blaming him. Gordon arrives and asks to speak to each owner to discover the problems. He speaks to Maureen about the suffering relationship between Chief and Mitch, Chief has invested $3,000,000 and thinks the biggest problem is Mitch whereas Mitch believes the biggest problem is his Father in law. Gordon orders the French onion soup, Shepherds pie and Fisherman’s platter. The soup tastes like onions in dishwater, the shepherd’s pie is a cottage pie with a glue like gravy and the fisherman’s platter is bland with rubber like scallops. He inspects the fridges and finds scallops that have been previously frozen, old and slimy chicken, blood in mozzarella sticks and raw and cooked meat stored together. Gordon says he would have never eaten had he seen the fridges and declares that they should not open for dinner. They clean up the kitchen and Maureen takes leadership of the clean up operation. The next day Gordon goes to the couples home where he speaks with Maureen about how Mitch has been worn down and they need to help him rediscover his passion. He speaks with Mitch and tells him to step up and lead the restaurant. Gordon introduces two specials, a shepherd’s pie and fish and chips, the new dishes are a hit with the staff. The kitchen are more concerned on getting the food out as soon as possible focusing on speed, asking whether they should pre fry the fish and if there is a way to cook burgers faster. Gordon witnesses a dinner service and is worried about the outdated, handwritten order system. The service begins slowly, the specials are well received but the old menu is a disaster. Gordon realises the problems are the cooks; they don’t know how to cook burgers and sent out poor shepherds pies. After the service, Gordon calls in chef James to help relaunch the menu and train staff. The next day, they arrive to a restaurant makeover, the restaurant is more modern with a communal dining table in the centre and a computer ordering system to replace the handwritten system. The menu also gets a makeover with new Irish-American dishes including Irish Ale stew and an authentic shepherds pie. On relaunch night, James is overseeing the cooks while Mitch expedites and takes the lead. The appetizers go out quickly and the customers like the new food. However as the entrées steam through the kitchen Mitch begins to crumble and the kitchen grinds to a halt. Chief steps in but ends up arguing with Maureen and Gordon removes Mitch from the kitchen changing him to a server where he takes the wrong dishes to the wrong tables. The dinner service is turned around and customers are happy. After the service, Gordon sits the owners down to tell them that they need to make some changes to make things work and to listen to James. Within days of filming, Chef Mario is sacked and James stays on to train the kitchen staff. Yelp reviews were mixed after the episode aired. 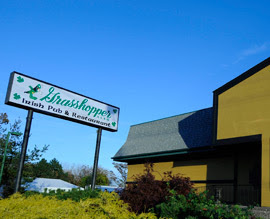 Grasshopper Also closed and was sold in October 2012 and reopened with new management, new staff and a new makeover. It became a sports bar called the Eastside Ale House, the new owners posted the below on Facebook. "For everyone who has supported Mitch, Maureen, and Chief for so many years, we would like to say thank you. And on behalf of the new ownership and management of the Grasshopper, we wish them the best and thank them for many years of great service. As for the future, we hope to only grow on the great foundation the Grasshopper has laid out for us. There will be many new things coming, all for the better. All are always welcome at the Grasshopper and we look forward to continuing to grow with you!" But this has since closed, Yelp reviews prior to closure were negative. The restaurant was sold an reopened as tapas bar Segovia Meson. Reviews are excellent. Grasshopper Also aired on February 18 2011, the episode was filmed in November 2010 and is Kitchen Nightmares season 4 episode 4. How drunk is the guy in that video? And is he reading from a prompt or being told what to say? Seems very suspicious. We used to eat here all the time the food was always terrible and the place was crummy. Didn't know it until a few weeks ago but we went there after Gordon had been there and the menu was boring and the food was tasteless. My grandmother loved the place, it was located pretty conveniently and she always got the same thing, which she thinks is the best thing ever. So, basically what you're telling us is that you have no taste buds. Who in the eff keeps returning to a place they hate? I think it has less to do with the staff being Mexican or lazy and more to do with bad management. The ones cooking likely never had any kind of training. Don't see how being Mexican has anything to do with it. One thing I've noticed from racist comments: they're likely made by ignorant suburbanites that have little to no exposure of different cultures other than those originating from Europe. One thing about liberal self-hating cuckolds posting self-righteous comments online is that they more often than not live in wealthy, majority-white gated neighborhoods and can count their encounters with the lower class on one hand. Different cultures have different work ethics and the Mexican staff running the place are not hard workers. Having grown up in Inglewood everyone with a brain knew not to bother with people who couldn't speak your own language, though I wouldn't expect limousine liberals to actually know anything about race relations amongst the lower class. ^ Wow, you ROASTED this original poster, anon.